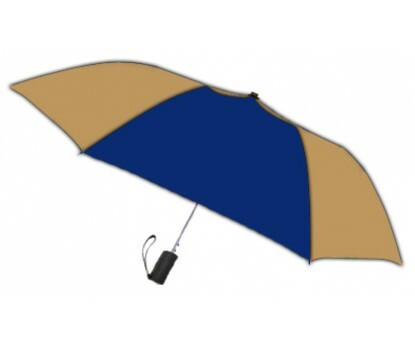 Personalized navy & khaki 42” arc spectrum automatic folding umbrellas can leave anyone stunned with their color profile and easy manageability. It is largely ordered for corporate gifting by marketers who use this color combination in their brand profiles or those who wish to stump their customers unawares! This umbrella can be sought for bulk gifting during some promotional events or as a part of special gifting. Features - push- button automatic function, matte black finish handle, and equipped with round strong metal shaft. Overpowered by a 42” arc hunter and khaki canopy. Matching fabric case is offered with umbrella. Imprint area – 6 x6.